No Man’s Sky can be a bit overwhelming at first, so many new places to see and so many things to document. We’ve collated a few of the best tips to help you as you first start your space adventuring career. 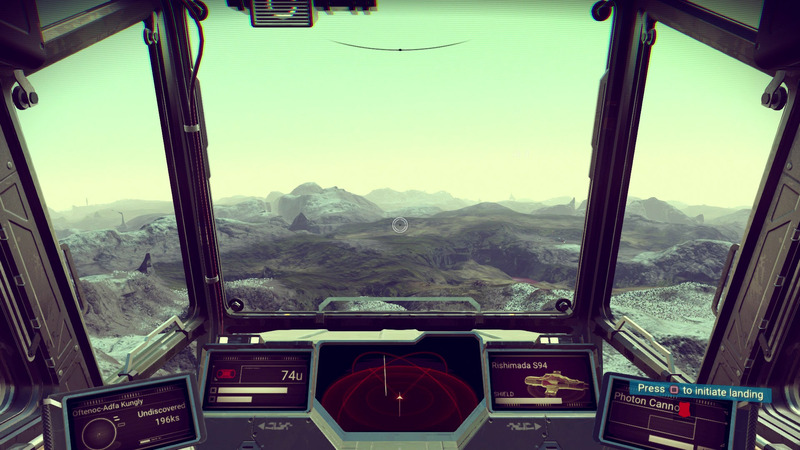 Here is everything you know as you begin playing No Man’s Sky. The running speed in No Man’s Sky is abysmally slow, so to increase the speed at which you traverse the planet try this little trick: begin sprinting, press melee followed immediately (almost at the same time) by jump. Pulling off the timing of this can be difficult but if done correctly you will fly through the air faster than the top running speed. You can keep this speed going by feathering the jump button to skim above the ground. Don’t resort to simply running around the planet for hours, jump in your ship and strike out in a direction. After fixing your ship and exploring the surrounding area you should use your ship to explore around the planet before heading into space. By using your ship to explore your starting planet you can cover more ground and sometimes stumble across Shelters or Stations that offer upgrades. Sometimes you’ll land on a planet full of wildlife but sparse on resources. These are ultimately not worth your time. Spend however long you want documenting the wildlife but don’t stay any longer than you need to if your main goal is accruing Units. It’s better to immediately leave a planet if it doesn’t offer you anything good. 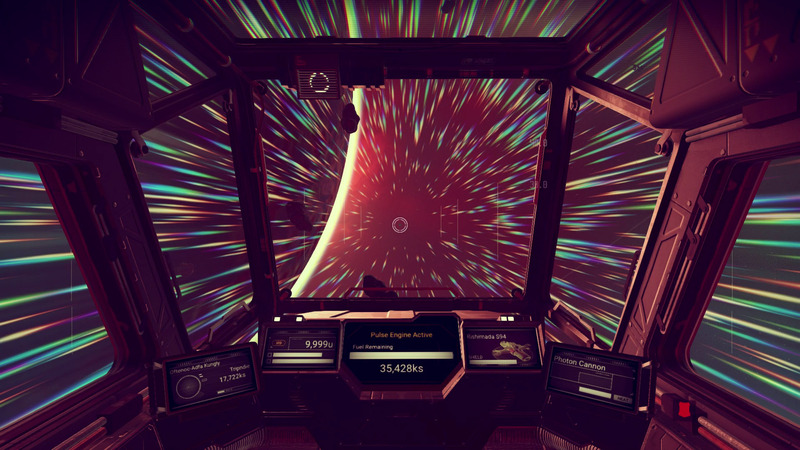 No Man’s Sky is a long game with billions of planets. You’re not going to miss anything if you leave quickly. Trying to fully complete a planet for the reward? Look for more creatures because plants don’t count toward the total. If you’re having trouble getting any of the final boxes and question marks cleared, search the skies for flying creatures or the oceans for swimming creatures. You may need to shoot the flying creatures out of the sky to properly scan them. Beacons are easily spotted by their bright orange beam of light and can be used to reveal new locations. You will need to insert a Bypass Chip into the Beacon for it to show you a point of interest. A Bypass Chip can be made with 10 Iron and 10 Plutonium, two resources that are relatively easy to find. 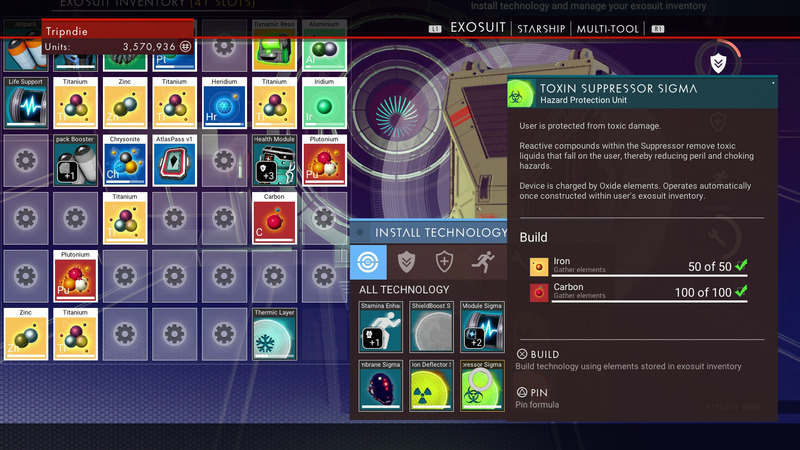 After placing the Bypass Chip in the Beacon you should select Shelter or Transmission as these two options can lead you to new Ships, Multi-Tools, and even Exosuit upgrades. Don’t feel bad about upgrading your ship, you’ll be needing the extra space to store all the expensive resources you find. Before you agree to the new ship, make sure you transfer everything across. After you’re in your new ship, go back to your old ship and choose to own it once more but this time keep everything in the better ship. Once you’re looking at your old ship, dismantle everything you can and take the resources back to your new ship. Do this with every ship you own so you don’t waste any of those precious resources. There are some extreme planets out there where your Life Support and Hazard Protection will deplete at an alarming rate. One tactic is to stand in close proximity to your ship, mine whatever resources is in front of you then jump back into your ship when your shield depletes. Another strategy is to install Exosuit modules which greatly reduce the stress on the Hazard Protection. These upgrade blueprints can be found in almost any location with buildings. There’s nothing worse than landing with no fuel in your Launch Thruster and realising you have nothing in your inventory for fuel. If you have no resources, try landing near an open cave or at a trading post to increase your chance of finding resources. Zinc is extremely important for keeping your Hazard Protection functioning and for creating new components. 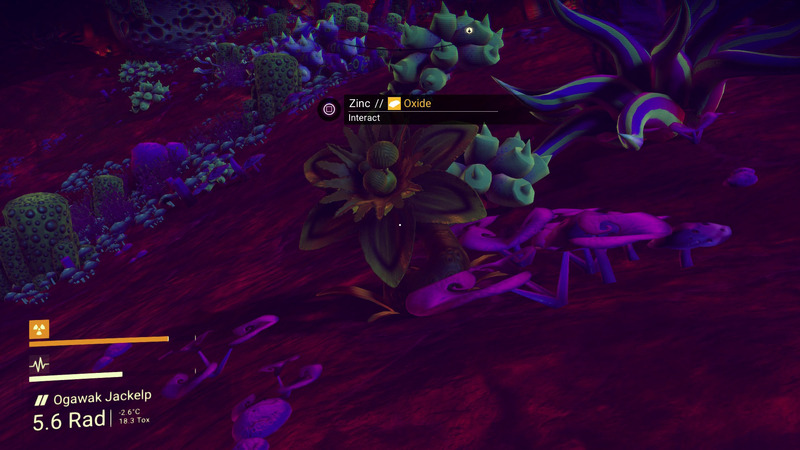 Anytime you find Zinc, either on a planet or at a Galactic Trade Network, collect as much as possible as it can be difficult to find. 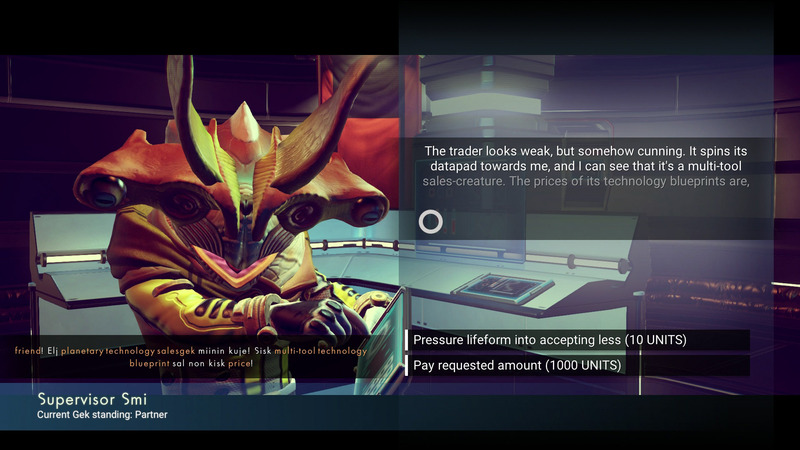 Whenever an alien asks to inspect your Multi-Tool they’re going to upgrade it. 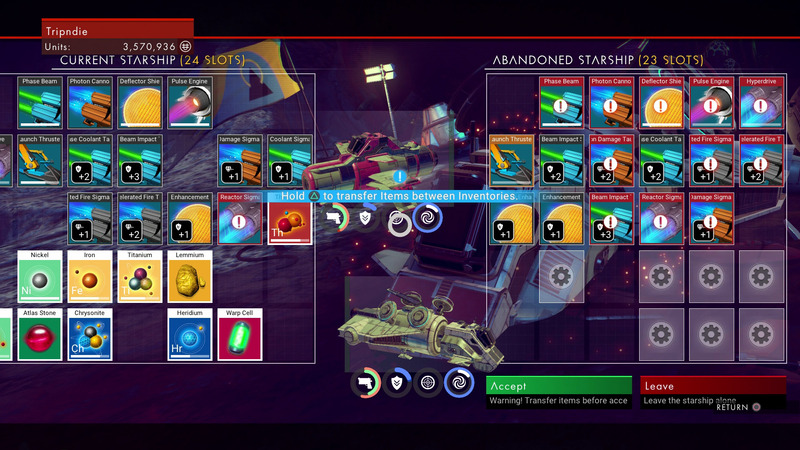 While it is concerning to hand your weapon over to a stranger, in No Man’s Sky the stranger is always going to either upgrade it or offer you a new one! 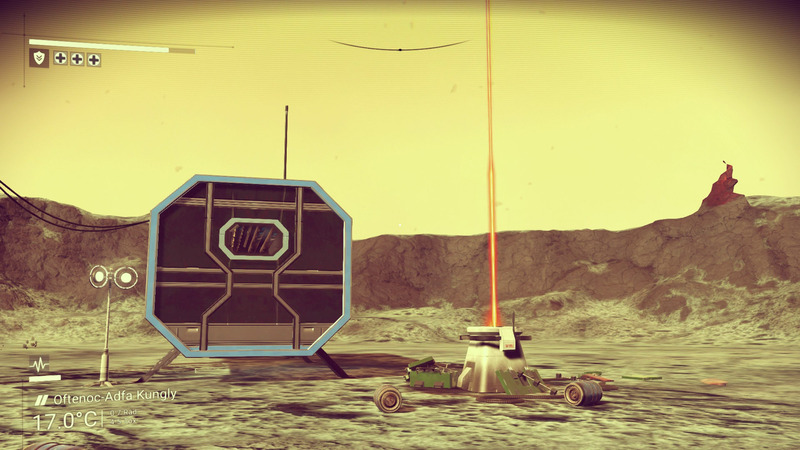 Some stations on a planet have landing pads or Starship Callers, so you should try to manoeuvre toward these before you hit the landing sequence. This is because when taking off from a landing pad your Launch Thruster will use no fuel. Sometimes fuel can be scarce on a planet, which can limit the amount of times you can take off. Use landing pads to alleviate this stress. Sometimes a beacon will show you a spot on the planet that is several minutes, even up to an hour away. To cut down on this travel time, aim your ship into the upper atmosphere to help increase your travel speed. Travelling close to the ground limits your speed to roughly 160 units. As you reach higher in the atmosphere this speed increases dramatically to the point where you can even use the Pulse Engine to zip around the planet. Use this diving in-and-out method to quickly travel long distances. 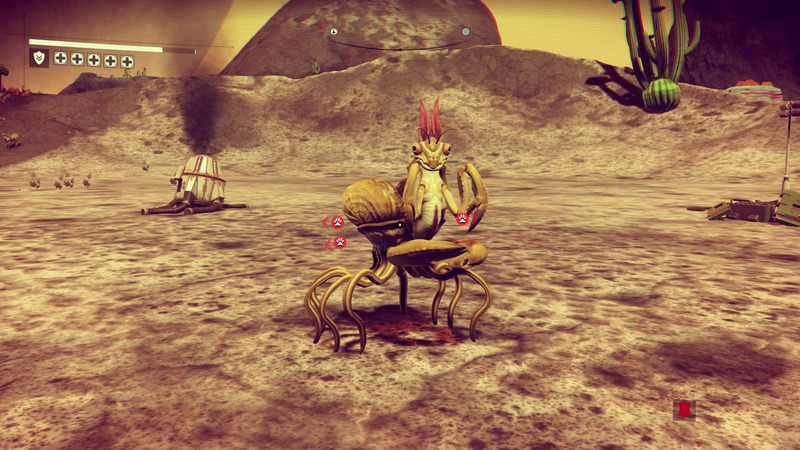 No Man’s Sky is a thoroughly entertaining game but it can be difficult to get into and understand. 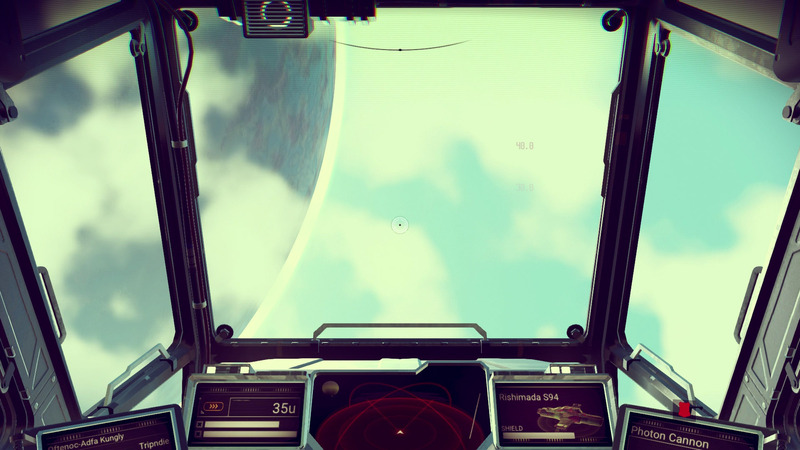 By using the above beginner tips you will find the first few hours of your No Man’s Sky career a little bit easier and less stressful! No Man's Sky Recent Update Is Great! 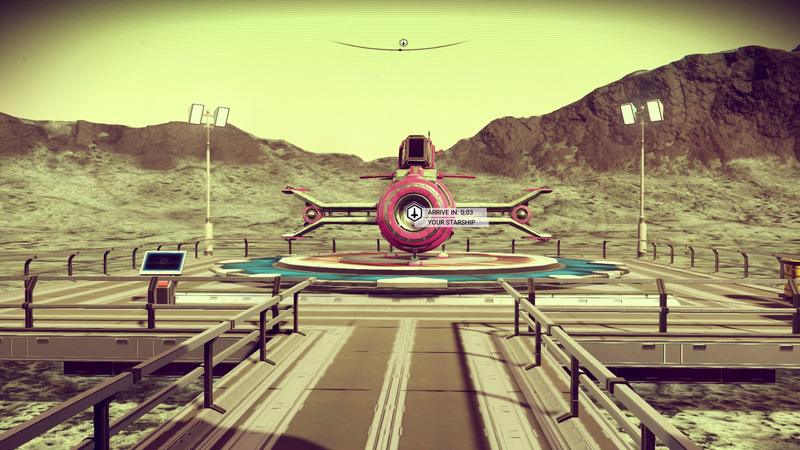 No Man’s Sky most recent update adds new vehicles, better lighting support and even more!